In addition to providing for your medical needs during treatment, the patient support services team also places a priority on your emotional wellbeing. We are happy to refer you to one of the many local support groups in the area. Optional weekly activities and outings are available for patients and their families, including activities in the Friendship Room and child play area onsite. The HOPE Wall gives inspiration from the many messages of encouragement signed at the center’s groundbreaking. These activities provide a good opportunity to get away, relieve stress, have some fun, and build relationships with others also receiving proton therapy treatment. Texas Center for Proton Therapy hosts a monthly support group for patients with prostate cancer and their spouses and/or caregivers. All patients with prostate cancer are invited –patients may have received treatment at Texas Center for Proton Therapy, been treated elsewhere (with proton therapy or another form of treatment), currently be in treatment, or be a prospective patient researching options for prostate cancer treatment. Join us on the first Tuesday of every month between 10:30 and 11:30 a.m. in the Friendship Room on the 2nd floor at Texas Center for Proton Therapy to discuss all aspects of prostate cancer from diagnosis, to searching for treatments, to treatment options and post-treatment. 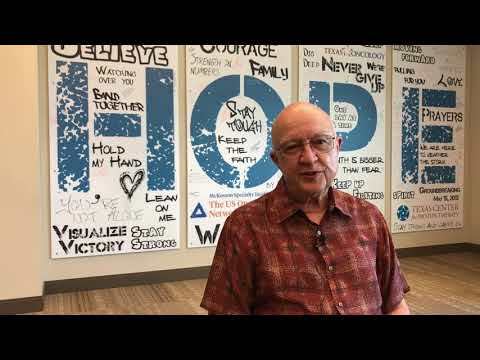 When former patient Anthony Nagy shared his thoughts on being treated for prostate cancer at Texas Center for Proton Therapy, we posed the question ‘why are you a part of the prostate cancer support group?’ This was his response.